Eighty years after his death, the legend of Ernest Shackleton and the extraordinary story of the Endurance South Pole expedition still hold a compelling grip on the public imagination. Trapped in drifting polar pack-ice for ten months, Ernest Shackleton and his crew fought for survival against all the odds. When the Endurance was finally crushed, they were stranded on ice floes for more than a year before reaching Elephant Island in April 1916. From there Shackleton and five of his men embarked on the most remarkable rescue mission in maritime history, sailing to South Georgia across eight hundred miles of the world's roughest seas in a small open boat. Despite failing to realize his dream of reaching the South Pole, Shackleton's story lives on because of his unique qualities of leadership and the extraordinary fact that all of his men survived. This compelling narrative probes the profound influence of Shackleton's Irish and Quaker roots in the making of a great leader. It offers a vivid portrait of a man at odds with the world and with himself, whose ambition was tempered by his flawed humanity and egalitarianism. Here too are the untold stories of Shackleton's upbringing in Kildare, his time in the Merchant Navy, his 1901 voyage on the Discovery with Robert Falcon Scott, his 1907 Nimrod expedition, his marriage and love affairs, his life as a public figure and politician, and the haunting story of his final, fatal expedition on the Quest. Drawing on family records, diaries, and letters - and hitherto unpublished photographs and archive material - this mesmerizing book takes us beyond the myth to Shackleton; the man, for whom "optimism is true moral courage," and whose greatest triumph was that of life over death. 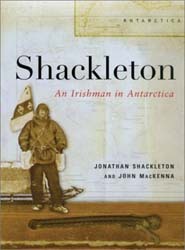 Shackleton: An Irishman in Antarctica is lavishly illustrated with more than a hundred photographs, maps, and engravings, some of them appearing in print for the first time.